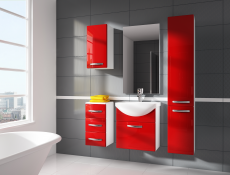 Narrow small wall mounted bathroom cabinet with 1 Door (without worktop) in White High Gloss / White Matt from modern Coral bathroom furniture range. 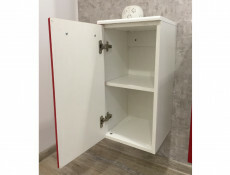 Body in white matt finish.Doors in White High Gloss finish made of high quality MDF curved edges.Moisture resistant MDF front.Universal fitting door can be left or right hand opening.Metal HandlesMatching items available. 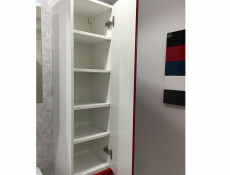 Body in white matt finish.Doors in Grey High Gloss finish made of high quality MDF curved edges.Moisture resistant MDF front.Universal fitting door can be left or right hand opening.Metal HandlesMatching items available. 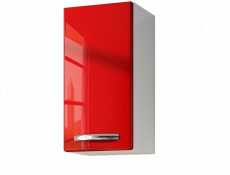 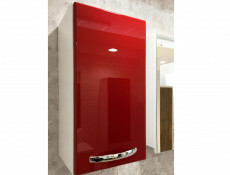 Body in white matt finish.Doors in Red High Gloss finish made of high quality MDF curved edges.Moisture resistant MDF front.Universal fitting door can be left or right hand opening.Metal HandlesMatching items available. 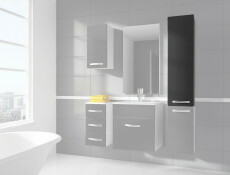 Body in white matt finish.Doors in Grey High Gloss finish made of high quality MDF.Moisture resistant MDF curved edge fronts. 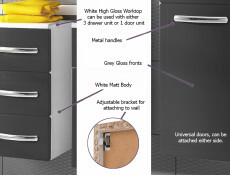 Universal opening.Metal Silver HandlesMatching items available. 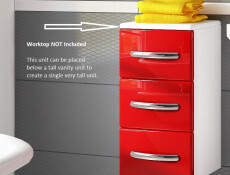 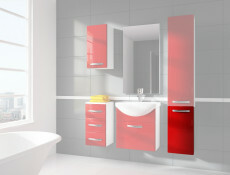 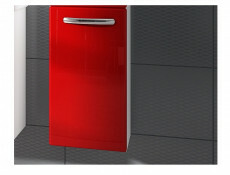 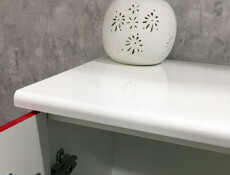 Narrow small wall bathroom cabinet with 1 door in Red High Gloss / White Matt from modern Coral bathroom furniture range. 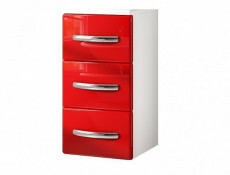 Body in white matt finish.Doors in Red High Gloss finish made of high quality MDF curved edges.Moisture resistant MDF front. 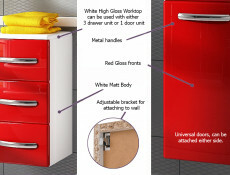 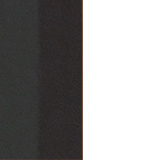 Universal fitting door can be left or right hand opening. 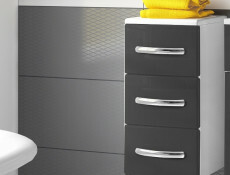 Metal HandlesMatching items available. 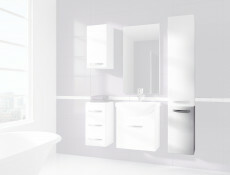 Body in white matt finish.Door in White High Gloss finish made of high quality MDF.Moisture resistant MDF curved edge front. 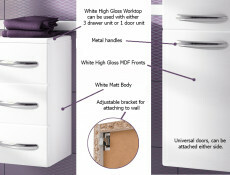 Universal opening.Metal HandlesMatching items available. 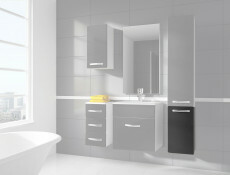 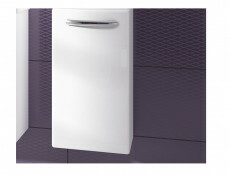 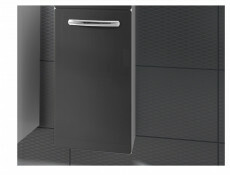 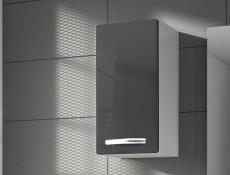 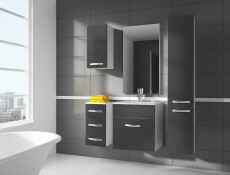 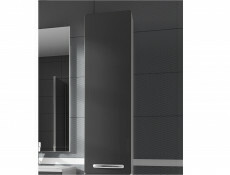 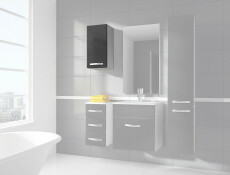 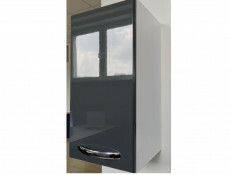 Tall Wall Mounted Bathroom Cabinet 1 Door Unit Grey High Gloss / White Matt from modern Coral bathroom furniture range. 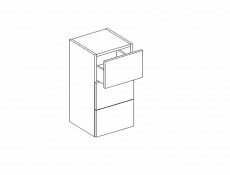 This unit can be used as an independent unit or alternatively can be hanged above a shorter wall (D30 P/L) unit to create one very tall unit as shown on set photos. 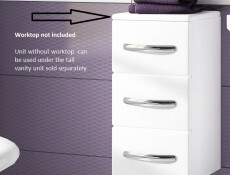 This additional unit can be purchased separately. 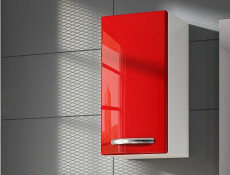 Also available in red or white gloss. 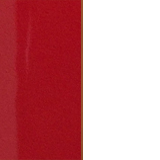 Please see our shop for the alternative colour options. 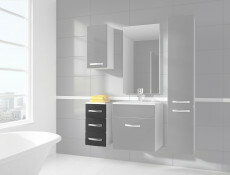 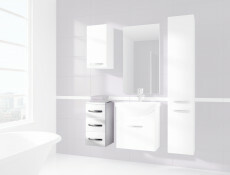 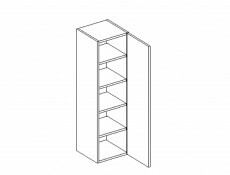 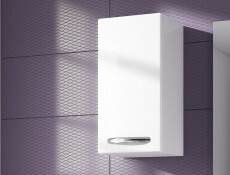 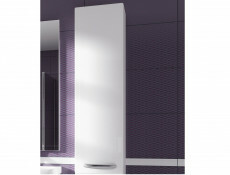 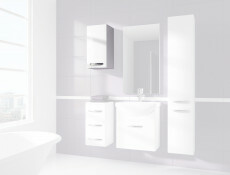 Tall Wall Mounted Bathroom Cabinet 1 Door Unit White High Gloss / White Matt from modern Coral bathroom furniture range. 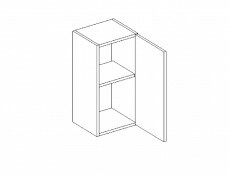 This unit can be used as an independent unit or alternatively can be hanged above a shorter wall (D30 P/L) unit to create one very tall unit as shown on set photos. 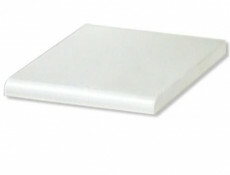 This additional unit can be purchased separately.